When my oldest son turned 11, he asked for a Bionicle Birthday. This party ended up being pretty easy, considering he chose to take a couple of friends to a local trampoline place (it had nothing to do with his theme, but was a great way for boys to spend an hour exercising and burning off energy. “I don’t care if you’re tired, get back up there and bounce. I PAID for this time already.”) After they were all bounced out, it was back home for a treasure hunt, presents and cake. In retrospect I would just buy a trampoline, I recommend the first one mentioned in this article. For those of you who may not know, Bionicle is a line of Lego toys with a rather elaborate back-story. I don’t recommend trying to understand the whole Bionicle history (it is long and complicated since Lego comes out with NEW Bionicles every year or so and they have to fit them into the storyline somehow), but you should brush up on the basics—the Toa are the good guys, there are six of them (in each iteration), they have “elemental powers” (whatever those are), and they all wear masks that give them these powers. If you need more detail, or images to use in décor, try these wiki sites, and Lego.com. When I found this font, my whole treasure hunt fell into place. I made his birthday sign (a tradition at our house) using both an English Font and the Matoran Alphabet font. This ended up working as his “key” for his treasure hunt. Honestly, I can’t remember how the treasure hunt began. He was told that he had to gather the 6 great Kanohi masks of the Toa in order to receive some fabulous prophecy that had been hidden for centuries (honestly, it was really well written. You just have to take my word for it). The masks were hidden according to their “elemental” power. 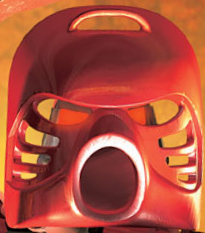 The Tahu mask (fire) was in the fireplace. Pohatu’s (stone) was outside in the rock garden. Lewa’s (air) was taped to an air vent. Gali’s (water) was in the bathtub. Onua’s (earth) was half buried in the dirt outside the back door. Kopaka’s (ice) was in the freezer. 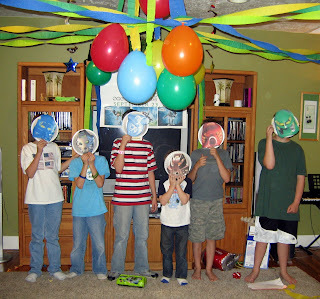 For the masks, I just printed out the images I found on Wikipedia, and attached them to paper plates. On the back side of each mask was a piece of the prophecy that the boys had to assemble. In the prophecy were several words that were written with the Matoran Alphabet and he had to use his sign to “translate” them. It ended up being rather obscure (but my son’s pretty bright, if I may say so myself). There was a reference in the prophecy to lying down at night, that directed him to his presents which were stacked on my bed (the one room that friends stay out of when they come over). 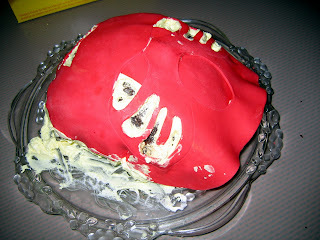 For the cake, my son showed me the picture of the mask he wanted me to recreate (Toa Nuva Tahu’s). I baked the cake in a metal mixing bowl and then cut the sides off of it to make it more oblong than round. I did a base coat of frosting and then used some (rather old—please ignore the “wrinkles”) red fondant to create the mask. I used fondant (and a small paring knife) to free-hand the little masks for the friend cupcakes (I don’t like giving kids a piece of the big cake—too messy). We ended up not eating the birthday cake that night. I have to include a picture of what I found the next morning after my 2-year-old had gotten to it. You snooze, you lose, I guess. Wow, that looks a lot of fun. Being the mom of older daughters, I wasn’t familiar with Bionicles. Now I am in the know! Very informing! I am sure I will need to know this for later! Great post Trina! My son is a Bionocle FREAK! This is a great party! Love all of the details. Saw this link on "One Pretty Thing" & had to come check it out. I'm the mom to three boys who ALL love Legos & Bionicles. I'm really not sure if I should show them this post or not. 😉 My oldest turns 13 this summer. I may have to go with it. Thanks for sharing the details! Thank you… thank you… thank you!!!! I have been all over the web looking for easy ideas for my son who will be 11 in November. I started looking for ideas early because I figured it would take me forever to find something "themed" just right for him. He LOVES Bionicles and is about to make me crazy trying to get me to understand them….LOL! I am so glad I found your blog. Thanks for the ideas! I'm so excited I can't wait to tell him! You are a wonderful mother. My 5 y/o is totally obsessed with bionicles and has been for over a year. He wants a Bionicle 6th Bday party so bad but I just don’t think I can put it together. I love what you did. I don’t have the guts to attempt the cake…maybe the cupcakes…but my freehanding is on a 2 y/o level. We’ll see. Maybe if he’s still obsessed when he’s turning 11, I’ll have developed the guts…and skill with Fondant! and 2005. Special care is taken while designing the metal parts since they may be corrosion resistant. the biggest replacement from the radio. Hi there to every one, since I am genuinely keen of reading this blog’s post to be updated on a regular basis. Hi, Neeat post. There is an issue along with your web site in internet explorer, would test this? essentially puts the percentages inside their favor from the gamblers.